This activity was designed for an introductory (semester long) biology class. I don’t often have time to go into taxonomy with much depth, but I do like to include major concepts, like kingdoms and scientific names with the unit on evolution. 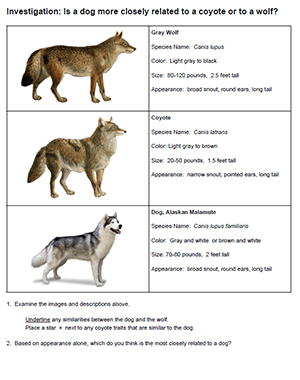 This worksheet has students look at three canid species: wolf, coyote, and dog, and then determine which is most closely related. 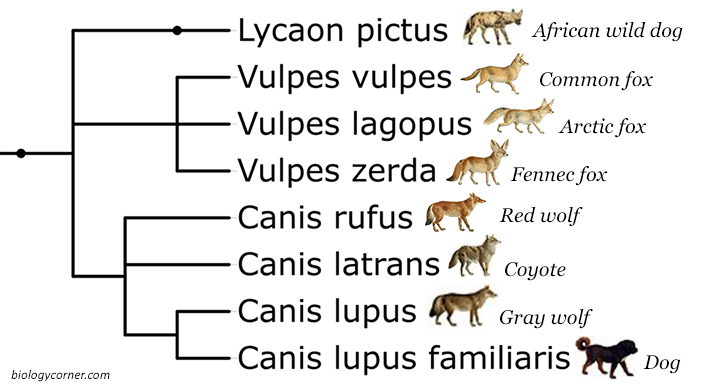 Students first read descriptions of the three species and are asked to underline features that the dog and wolf share, then place a star next to similarities to a coyote. The goal here is to make some general comparisons. Then, students examine a phylogenetic tree which has questions for them to discover how the tree is organized. Students will learn what a node is, and how branches on the tree represent descendants from a common ancestor. In addition, students are introduced to the concept of a scientific name (genus + species) and subspecies, as in the case of a domestic dog. This activity can be done is small groups or as a whole class guided exercise. A guided activity does allow room for whole class discussion on what makes a dog different from a wolf or a coyotes. If you have watched the film “Dogs Decoded” this is a great follow-up activity to bridge the unit of genetics and evolution. Students will also start with many preconceived notions about what a wolf is, allowing for some rich in-class discussions about domestication and animal behavior. These resources are awesome! Thanks for sharing!